Recently I have been loving Nykaa.com. They make makeup shopping so much more easy and time saving. At first, we have the ease of sitting at home and browse through a wide category of makeup and beauty products available. Secondly, we can research and read customer reviews about the products and then decide which products would suit us best. I recently bought a few makeup products from Nykaa.com which really took me away!These were mostly products from NYX. Ever since I found out that NYX products are available on Nykaa.com I’ve been a fan of their range. I have heard so many good things about NYX beauty products that I was really excited to try them for myself. NYX is a company that have high quality makeup but unlike many other cosmetic brands, these NYX products won’t be too heavy on the pocket. NYX products are all cruelty free and personally I feel they are great value for money. Today I’ll be sharingmy shopping experience with nykaa.com and my haul with all of you. Go Ahead and Check it out. About Nykaa.com: Nykaa.com is an online store for all beauty related products. They have more than 200 brands and more than 10,000 beauty products available on the website. All products are 100% authentic, sourced directly from the brands or authorized distributors. Nykaa ships products to more than 900 cities across the country to almost 9,000 zip codes using the services of leading and reliable courier companies. The website is well designed and easy to navigate. After using the NYX Cosmetic’s Stay Matte but not Flat Liquid Foundation for few days now, I have become a fan of it. 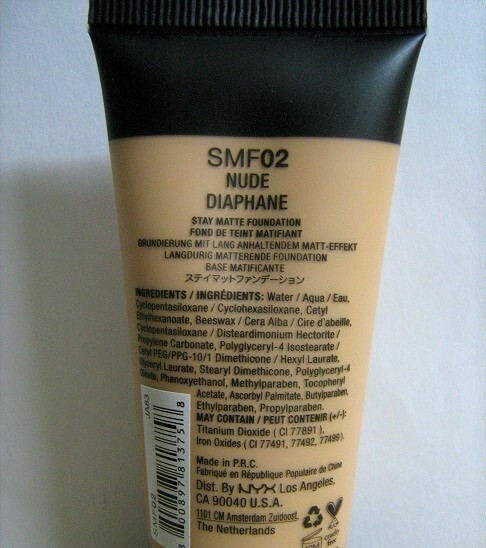 This foundation provides full coverage and that too which is mineral enriched so it does not harm our skin in anyway. The best part about this foundation is that it gives a matte finish that does not make our skin oily. Its water based formula is perfect for an all day long wear! NYX Professional Makeup Stay Matte But Not Flat Powder Foundation is a beautiful powder foundation, which is very soft and literally featherlight in texture. Sets your concealer and foundation just perfectly and makes the face look really very smooth and mattified. Oh My God Guys! I just love the lip lingerie formula by NYX. This is a very lightweight and smooth lipstick. It comes with an applicator which easily glides on the lips. It has a very mouse like texture that dries completely matte post application. I was happy with this lipstick as it stayed on for a decent time. I had it on for a good 7-8 hours. It is smudge proof and transfer proof although not completely. It can survive light meals and drinks. This is such an amazing eye pencil, especially the linen shade, it looks really gorgeous especially in the waterline. You even use it as an eye shadow, this pencil glides on really very smoothly, it’s very creamy and pigmented. Another thing I received from Nykaa was this brand new stunning selfie ring light. And I didn’t have to pay anything for it. All I had or do for this was make a purchase of NYX Professional makeup valued uptoatleastRs. 1500/-. And guys! I can’t thank them enough for sending me this. This is a perfect device which gives you a perfect selfie even at the time when no light is available. If you love to be creative and you love to experiment with different lightingoptions, then this device is perfect for you. Overall, Nykaa.com offers one of the largest brand selection in beauty and makeup products. The website interface is excellent and the delivery is very efficient. The store offers every mode of payment, credit/debit card as well as Cash on Delivery. Apart from this, it also offers regular discount offers on many branded products. For me it was a very nice shopping experience shopping with this website and highly recommend it!! Also, I would love to know, have you have ever shopped at Nykaa.com? How was your online shopping experience with Nykaa.com? Also, please let me know if you guys would want me to review the above products I bought. Please drop in your comments below.